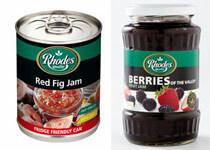 Some nice jam innovation from Rhodes Food Group: in a variant first for South Africa, it has launched Red Fig in a fridge-friendly can, and revamped the packaging for its Jams in Glass range. All jam cans from Rhodes now also have a protective inner coating and can be kept open in the fridge. This new addition from Rhodes’ expands their 450g canned jam range to 12 products: Apricot; Berries of the Valley; Ripe Fig; Mixed Fruit; Peach; Youngberry; Strawberry; Sweet Orange Marmalade; Seville Orange Marmalade; and Pineapple. It has also announced that all its canned jams will soon have the reusable plastic snap cap, making the can much more user-friendly. In introducing another new variant, Berries of the Valley in a 460g glass jar, Rhodes says it hopes to add another winner to this jam range. Top of this category is Rhodes Strawberry Jam. The Jams in Glass range, with strikingly designed labels, are now packaged in “nice to hold” new ridged glass bottles with a white cap. The jams in glass range includes Lime Marmalade; Seville Orange Marmalade; Rip Fig; Apricot; Strawberry; Berries of the Valley; and Youngberry.